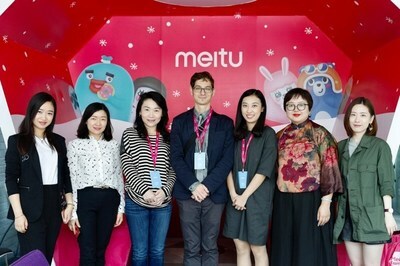 XIAMEN, China, April 12, 2018 /PRNewswire/ -- Meitu Inc. (Meitu), a global leading mobile Internet company with a portfolio of photo enhancement apps, smart hardware, and short-form video community platform Meipai, has hosted a meeting at its headquarter in Xiamen with Colin Machado, Cultural Affairs Officer, the U.S. Consulate General, to discuss future cooperation and exchange ideas about the development of social media platforms in China. During the visit, Hanze Chen, Meitu's VP of marketing, introduced Meitu's development, its line-up of products and the firm's overseas expansion plans to Mr. Machado. Cai Hua, VP of Meipai, Meitu's short-video arm, also presented the "short-form video community platform" and trends of live streaming to the visiting group. "We are looking to cooperate more with the consulate on cultural projects and support their public service events," said Chen. "With Meitu and Meipai's well-established platforms and communities in China, the U.S. Consulate will be able to further reach the target audience for public good." "We often host guests from the U.S., including scholars, artists, musicians and dancers," said Mr. Machado. "We can use short videos or even live-streaming platforms to broadcast our events to the audience nation-wide." Meitu cooperated with the U.S. Consulate in Chinese Zodiac Year of the Goat to produce a short video through Meipai to celebrate Chinese New Year, with the video was being posted on the Consulate's Weibo page. "The video went viral among the consulate staff, and was posted on our social media platforms. Fans liked it," said Mr. Machado. "That video gave us a character, and it was the most successful thing we've done in terms of public outreach." 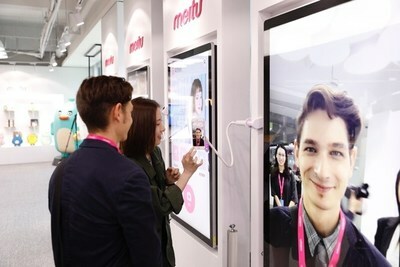 As Meitu expands overseas with a growing user base, its slate of products will become more appealing to overseas users as a communication tool. In 2017, Meitu saw a 29.5% year-on-year growth in overseas users and has reached strategic partnerships with Google and Facebook for years. Meitu rolled out three AR effects within the Facebook app last year, and has worked with Google in advertisement placement in Hong Kong and Taiwan. In addition, this March Meitu launched a co-SNS campaign with AliExpress on Facebook, incentivizing users to download BeautyPlus, a photo enhancement app that helps Meitu make a foray into overseas markets where its number of MAUs (Monthly Active Users) already top 50 million. People who download the app can use its AR filters to win coupons by playing games and completing tasks. "Our overseas expansion has grown exponentially thanks to our partnerships with Google and Facebook," said Xinhong Wu, founder and CEO of Meitu. "Through more cooperation with the American Consulate in China, we aim to serve a broader audience and promote their content with our social media resources for the public good." According to Meitu's 2016 Annual Report, it indicates the company has amassed over 500 million overseas users. The total number of users in 11 countries and regions each has exceeded 10 million in Brazil, the United States, India, Indonesia, Japan, Malaysia, the Philippines, Korea, Thailand, and Vietnam, etc. Established in October 2008, Meitu is a leading mobile Internet company headquartered in China. With the vision of building software and hardware around beauty, Meitu has developed a rich portfolio of software and smart hardware products such as Meitu, BeautyCam, Meipai (a short-form video community app) and Meitu Smartphones, which have transformed the way people create and share the idea of beauty. As of June 2017, Meitu has amassed over 1.5 billion unique users worldwide and engaged 481.3 million MAUs. It has successfully established its influence in overseas markets with more than 500 million users abroad, even launching localized apps and building teams overseas in places such as New Delhi, India; Sao Paulo, Brazil; Palo Alto, California; Singapore and Tokyo, Japan. According to App Annie, Meitu has repeatedly ranked as one of the top eight iOS non-game app developers globally from June 2014 to January 2017.